Crow Bliss /Hawks Aloft Inc.
Indigo, an HAI education bird sunning on the glove. Crows seem to enjoy basking in the sun. Noted wildlife biologist, John Marzluff, writes of this natural behavior, albeit odd, in his book, In the Company of Crows and Ravens. “Whole family groups may litter the ground seemingly dead, but if you try to approach they quickly come to life and move away.” He offers this explanation: sunlight converts preen oil into vitamin D, an important nutrient, which the bird later consumes during preening. 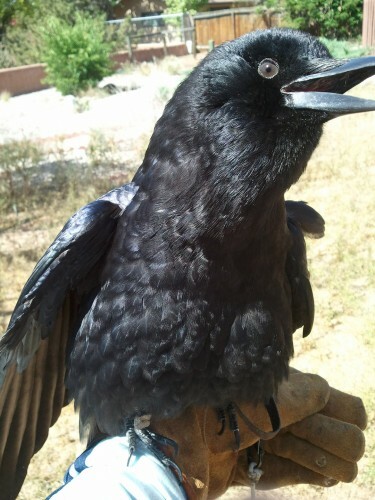 Marzluff, a professor of wildlife science at the University of Washington, is known for his research on crow behavior. His work on the birds’ ability to recognize human faces was featured in a 2010 PBS documentary.